I will always remember the day when one of my former bosses told me I should focus on (watching, making) videos rather than (reading, writing) books. I am a book person so I will probably not follow his advice ! Still from time to time I discover movies about High-tech innovation and entrepreneurship, start-ups. 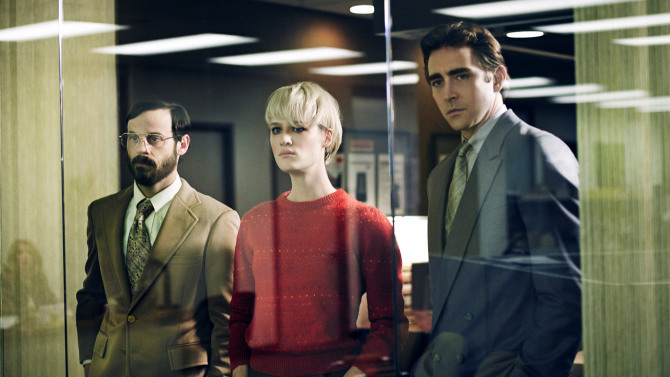 Halt and Catch Fire is not precisely about start-ups, it is not a documentary, it is not a movie. It is a TV series that is certainly more serious (and less fun) than HBO’s Silicon Valley. It is an interesting accident that I began watching it while reading Isaacson’s the Innovators. Both talk about the early days of Personal Computers in a (rather) dramatic manner. 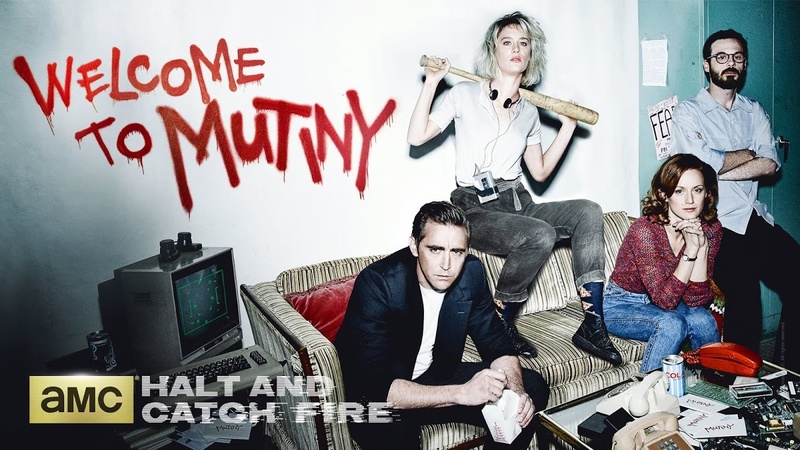 According to Wikipedia’s article about the series, “the show’s title refers to computer machine code instruction HCF, the execution of which would cause the computer’s central processing unit to stop working (“catch fire” was a humorous exaggeration).” It the series is not about entrepreneurship and start-ups so far, it is about rebellion, mutiny. There is a beautiful moment where one of the heroes convince his two colleagues to follow when they are about to stop. They are on quest. – I began with Something Ventured, a documentary about the early days of Silicon Valley entrepreneurs and venture capitalists. – The Startup Kids is another documentary about young (mostly) web entrepreneurs. Often very moving. – HBO’s Silicon Valley is funnier than HFC but maybe not as good. Only time will say. So as a conclusion, watch the trailer. This entry was posted in Must watch or read and tagged Rebellion, The Innovators on November 4, 2015 by Hervé Lebret. Innovation in (Silicon) Valley: after the chip, innovation saw the arrival of games, software and the Internet “As they were working on the first Computer Space consoles, Bushnell heard that he had competition. A Stanford grad named Bill Pitts and his buddy Hugh Tuck from California polytechnic had become addicted to Spacewar, and they decided to use a PDP-11 minicomputer to turn it into an arcade game. […] Bushnell was contemptuous of their plan to spend $20,000 on equipment, including a PDP-11 that would be in another room and connected by yards of cable to the console, and then charge ten cents a game. “I was surprised at how clueless they were about the business model,” he said. “Surprised and relieved. As soon as I saw what they were doing, I knew they’d be no competition”. Galaxy Game by Pitts and Tuck debuted at Stanford’s Tresidder student union coffeehouse in the fall of 1971. Students gathered around each night like cultists in front of a shrine. But no matter how many lined up their coins to play, there was no way the machine could pay for itself, and the venture eventually folded. “Hugh and I were both engineers and we didn’t pay attention to business issues at all,” conceded Pitts. Innovation can be sparked by engineering talent, but it must be combined with business skills to set the world afire. You may also so listen to Bushnell directly. This is Something Ventured and the Atari story begins at 30’07” until 36’35” (you may go on Youtube directly for the right timing). In the same chapter which tries to describe who were the inventors (more than the innovators) in the case of the Internet – J.C.R. Licklider, Bob Taylor, Larry Roberts, Paul Baran, Donald Davies, or even Leonard Kleinrock – and why it was invented – an unclear motivation between the military objective of protecting communications in case of a nuclear attack or the civilian one of helping researchers in sharing resources – Isaacson shows once again the challenge of convincing established players. [Davies] came up with a good old English word for them: packets. In trying to convince the general Post office to adopt the system, Davies ran into the same problem that Baran had knocking at the door of AT&T. But they both found a fan in Washington. Larry Roberts not only embraced their ideas; he also adopted the word packet. “Dompier published his musical program in the next issue of the People’s Computer Company, which led to a historically noteworthy response from a mystified reader. “Steven Dompier has an article about the musical program that he wrote for the Altair in the People’s Computer Company,” Bill Gates, a Harvard student on leave writing software for MITS in Albuquerque, wrote in the Altair newsletter. “The article gives a listing of his program and the musical data for ‘The Fool on the Hill’ and ‘Daisy.’ He doesn’t explain why it works and I don’t see why. Does anyone know?” the simple answer was that the computer , as it ran the programs, produced frequency interference that could be controlled by the timing loops and picked up as tone pulses by an AM radio. Isaacson, through his description of Gates and Jobs, explains what is an entrepreneur. 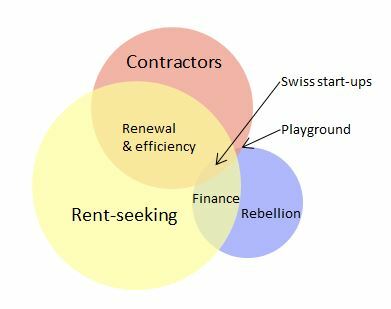 This entry was posted in Innovation, Must watch or read and tagged Business Model, Entrepreneur, Innovation, Rebellion, The Innovators on October 29, 2015 by Hervé Lebret. At the Frontier of Research – the Universe and the Brain – and how Science works? I just read two amazing books, which at first sight do not seem to have much in common, but indeed have. 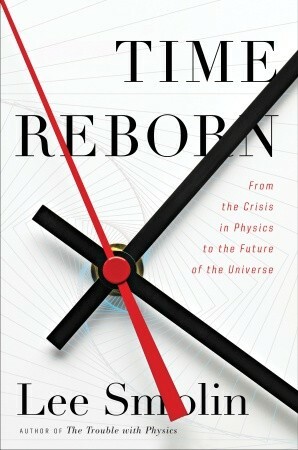 The first one is Time Reborn by Lee Smolin. The second one is Touching a Nerve by Patricia Churchland. Beware Newton, Leibniz (not only Einstein) is back! In about 1989, psychologist Bernard Baars proposed a framework for research on consciousness with a view to fostering a coevolution of psychology and neurobiology. 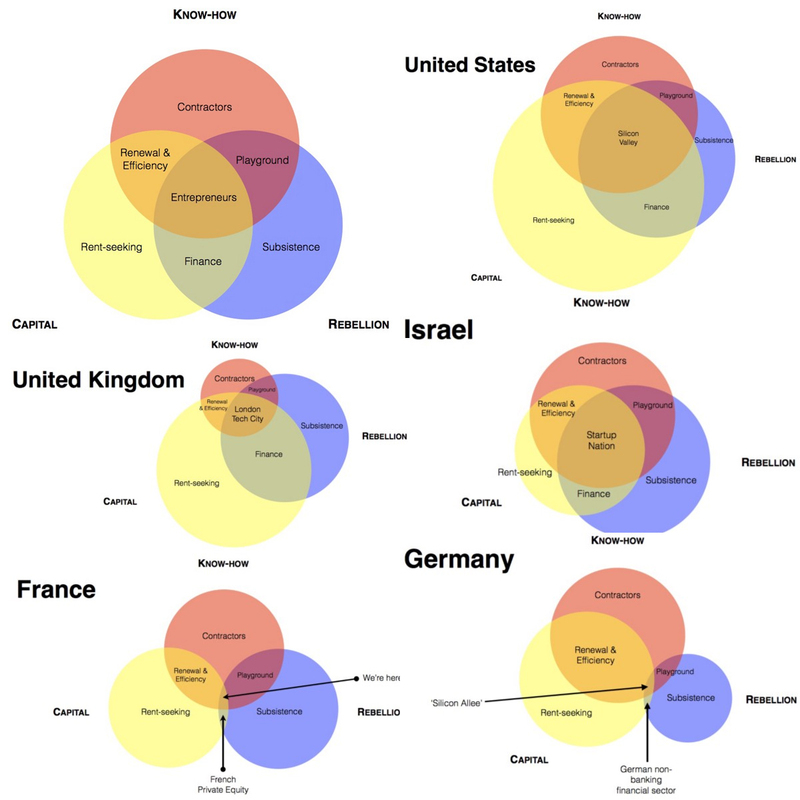 None of these five features is a blockbuster on its own, but notice that collectively they yield a sensible and rather powerful framework for guiding research into further matters, such as how information is integrated and rendered coherent in our experience. Wisely, Baars avoided trying to identify the essence of consciousness, realizing that essences are an old-fashioned way of thinking about phenomena that impede making actual progress. This contrasts with the approach favored by some philosophers, whereby they tried to identify the defining property of consciousness, such as self-referentially, which is knowing that you know that you are feeling an itch or pain. Both Smolin and Churchland have the highest respect for scientific research and researchers on a quest for truth. Just for that reason, you should read them! This entry was posted in Must watch or read and tagged Rebellion, Science on September 26, 2014 by Hervé Lebret. I have not read (yet) Isaacson’ authorized biography of Steve Jobs but found (by pure accident) another recent, funny an really great book, The Apple Revolution. 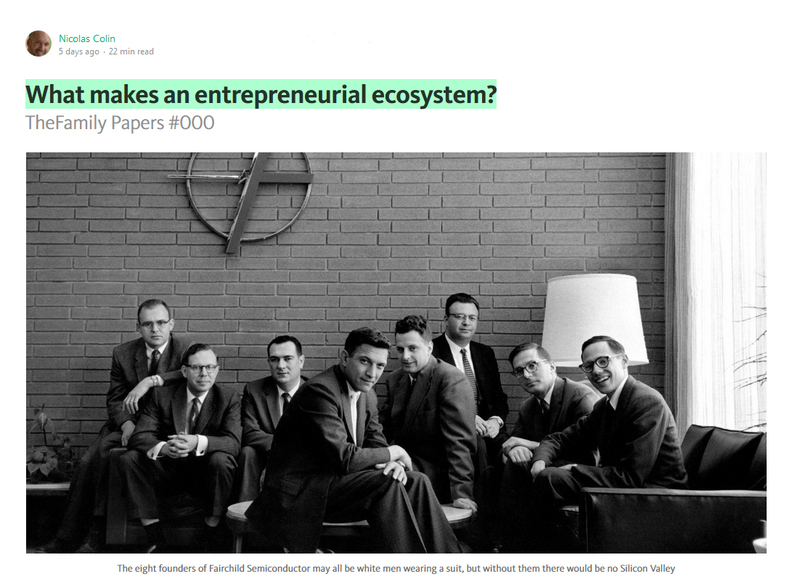 Interesting too and somewhat related to a previous blog I published on Robert Noyce and the culture of Silicon Valley. 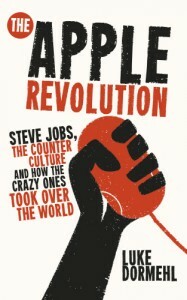 As important is the subtitle: Steve Jobs, the Counterculture and How the Crazy Ones Took Over the World. There are so many (unknown-to-me) anecdotes that I will only mention a few. 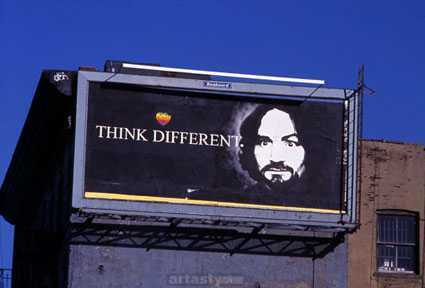 For example, I did not know about Ron English, the guerrilla street artist who circumvented Apple’s billboards using murderer Charles Manson. – Computers can change your life for the better. You will learn about the history of the Apple logo [pages 85-90] and the first killer apps (word processing and spreadsheets). I did not know Paul Lutus and John Draper. 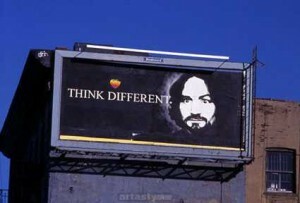 And what about Apple first ad campaigns! You will also read about the legal issued Apple faced in the music field and the funny origin of the Sosumi. It’s not only about Apple, you will read about Next early team, Dan’l Lewin, Rich Page, George Crow, Bud Tribble Susan Barnes an Susan Care as well as Pixar’s founding team, Alvy Ray Smith, Edwin Earl Catmull and John Lasseter ; “Pundits even came up with a tongue-in-cheek name for the unlikely convergence of Silicon Valley technology and Hollywood moviemaking. They called it Sillywood.“ [Page 303] So you can comment my tentative cap. 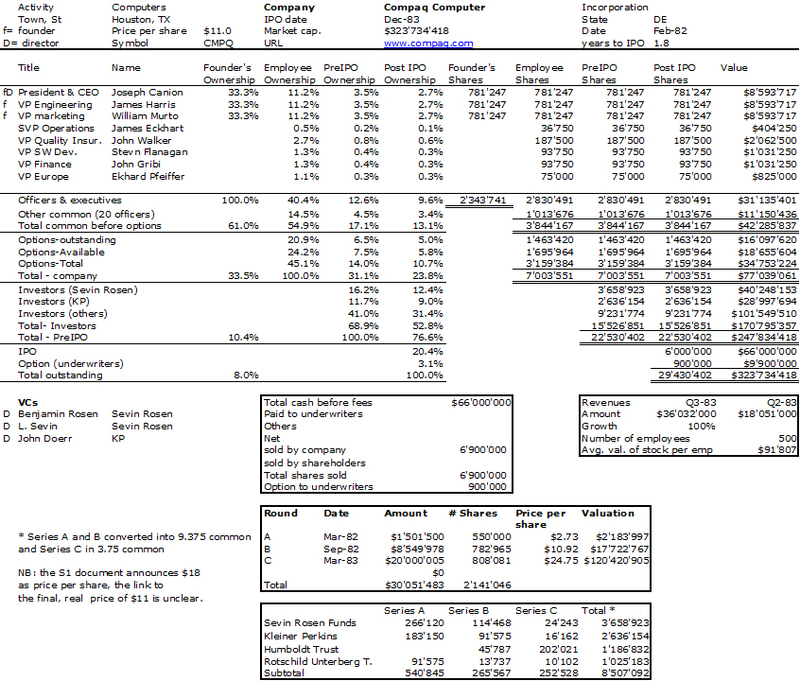 table of NeXT (see below) when acquired by Apple. Another piece of video is Pixar first work, The adventures of Andre and Wally B. If Jobs did OK with Next, what about with Pixar. 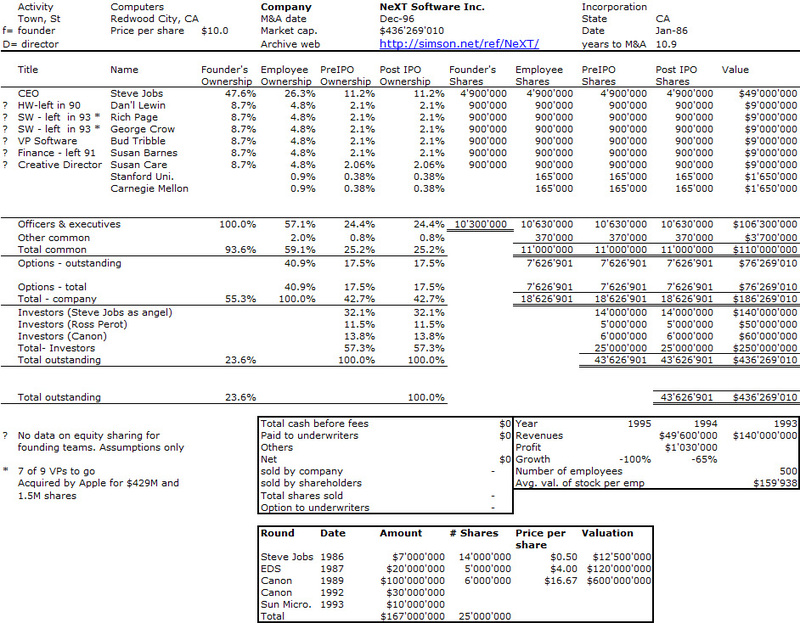 He got 70% for $10M then Smith and Catmull each had 4%. 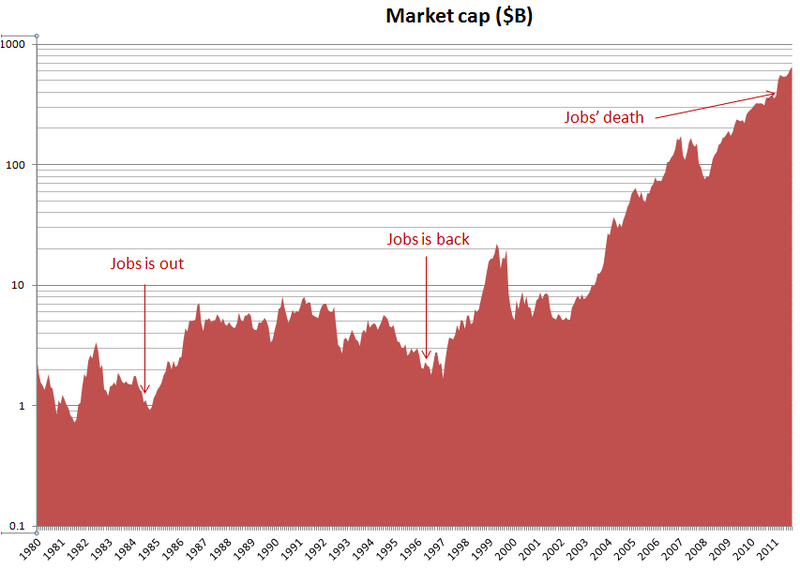 But jobs got 100% after putting $50M. [Pages 335-336] There is also the funny anecdote that the iMac could have been called the MacMan, sounding “like a cross between the video game Pac-Man and Sony’s handheld music player, the Walkman.” [Page 413]. There is also an analysis of intellectual property [Pages 430-431] “Whether or not a breakdown i traditional copyright laws odes, in fact, lead to a similar decline in creativity and innovation remains a hotly contested debate” adding that “Gates, typically referred as imaginative”, and having “never invented anything” is wrong. 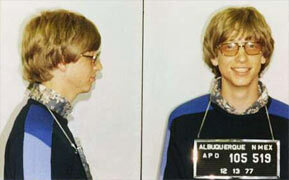 “Gates had invented the notion that Software (be it entire operating systems or simple files) could be sold. Jobs merely reframed the idea as a necessary protective measure for creativity.” Apparently Dormehl advises to read Lawrence Lessig’s The Future of Ideas. In the final chapters, Dormehl addresses the Apple paradox of the counterculture becoming mainstream. He quotes Norman Mailer [Page 384] “One is Hip or one is Square” and he adds [Page 408] that “no one better summarized the new ruling creative class of boomer bobos (that’s bourgeois bohemians) than Steve Jobs. […] They are prosperous without seeming greedy; they pleased their elders without seeming conformist; they have risen towards the top without too obviously looking down on those below; thy have achieved success without committing certain socially sanctioned affronts to the ideal of social equality; they have constructed a prosperous lifestyle while avoiding the old clichés of conspicuous consumption.” Then [Page 456] Paul Lutus describes the App Store as a “classic marketer’s dream, with too many programmers with too many programs chasing too few buyer dollars, and the marketer in the middle the only really cashing in.” (Perfect capitalism, long if ever lost counterculture…) “Apple turning its back on its founding libertarian ideals.” […] “With the suggestion made that high-tech libertarianism apparently leans heavily towards the puritanical.” Still Jobs did not forget some elements of the start-up culture. “Jobs wanted the department to have only one hundred people, since that was the number of names he could remember.” “Apple was able to avoid unnecessary levels of bureaucracy. We’re the biggest start-up ion the planet Jobs proudly noted in 2010.” [Pages 462-463.] About innovation, “Gladwell’s suggestion (via economists Ralf Meisenzahl and Joel Mokyr) is that it is history’s tweakers – more so even than its inventors – who truly define the age: The visionary starts with a clean sheet of paper, and re-imagines the world. The tweaker inherits things as they are, and has to push and pull them toward some more nearly perfect solution. that is not a lesser task. [Page 474] And as a near final quote from Norman Mailer again “One is a rebel or one conforms, one is a frontiersman in the Wild West of American night life, or else a Square cell, trapped in the totalitarian tissues of American society, doomed willy-nilly to conform if one is to succeed.” “It is for this reason that musicians like Jim Morrison and Jimi Hendrix who passed away at the age of twenty-seven, will forever be seen as young, idealistic rebels.” “The sheer scale of the current Apple makes it difficult to consider it any kind of rebel.” [Page 502] “Despite being declared moribund 59 times since 1995” [Page 495] , Apple is a formidable capitalist story as the next graph shows. This entry was posted in Must watch or read and tagged Apple, Equity, Innovation, Rebellion, Silicon Valley, Steve Jobs on September 20, 2012 by Hervé Lebret.